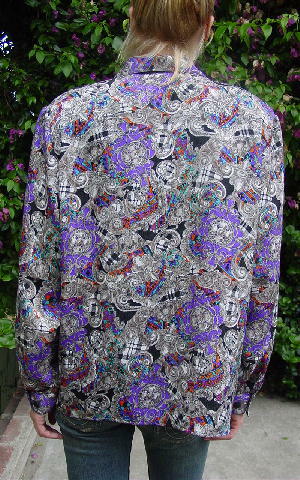 This 100% polyester long sleeve blouse has shoulder pads and is by Notations. 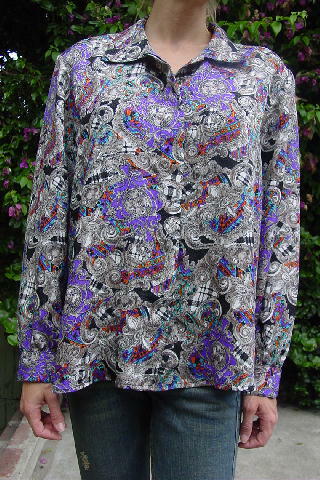 There are 5 clear buttons down the front and a top snap closure, all covered by a full front placket. The cuffs each have 2 black buttons. 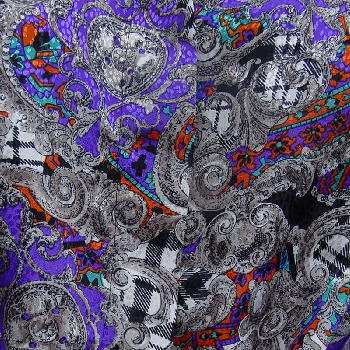 It has a tone-on-tone pattern in black, white, orange, purple, turquoise, gray, and light taupe. There are 2 extra clear buttons under the front collar tips. It's from a larger size model. It's now too small for her. shoulder to shoulder 18 3/4"
shoulder to end of sleeve 24 1/8"
shoulder to hem 26 1/2"
bottom hem side to side 25 1/2"